What is YouToken? 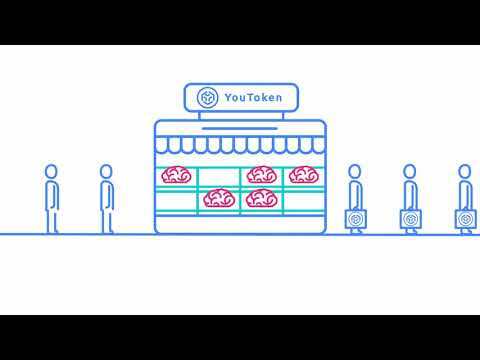 YouToken - First Blockchain-based Crowdfunding platform. We are building a platform where each creative individual (artist, doctor, technician, etc.) will be able to feature his/her talents and sell shares representing those talents in exchange for financial support/real investments. Just like investors are able to purchase Google stocks or Apple stocks, they will be able to purchase stocks representing real humans (entrepreneurs). The more successful a creative individual becomes, the more valuable his/her “stock” becomes. We take people’s creative ideas and commitments and convert them into tokens. YouToken is a blockchain-based decentralized crowdfunding platform. We are building our platform as an Ethereum-based DApp. Compiler – a blockchain Ethereum-based application, which issues YTN_creatorname tokens and smart contracts for crowdsales. Internal Decentralized Exchange – an exchange powered by 0x project technology. We use the latest AI-based KYC technologies to verify user identity in seconds and prevent creators from encountering roadblocks such as spending too much time on paperwork. All creators' data is stored via Ethereum blockchain. The user verification process is fast, secure, and built to protect investors from fraudulent activities. We make crowdfunding trustable again. Our technology helps talented entrepreneurs get financial support for their projects more quickly than "classic" fiat money platforms. All entrepreneurs' commitments are regulated by smart contracts and the investors’ voting process. Smart contracts dictate the terms for the projects’ development. Investors decide whether or not the project step was completed, so that the process can move on to the next step. If the investors vote “completed,” then the entrepreneur receives the next portion of funds. If they vote “not completed,” then the remaining unused funds from crowdsale are returned to the investors. Following are the essentials from a review we prepared for our investment club committee. At the first sight it looks like a very interesting concept. Getting an investment on that early stage and an opportunity to invest into a talented person before such person becomes great are both appealing to me and the general public. Just from the WhitePaper alone it becomes clear, that the general of the YouToken is shady on purpose and the first and the general claim "YouToken is a unique platform that allows people to convert human intelligence into a financial asset (a token)" doesn't actually find a support in the "human intelligence" part. It is not about anyone's intelligence, it is about a single project of an entrepreneur (not everyone, not you most likely). And a sole project neither represent someone's intelligence to any satisfactory precision, nor the fail or success of such project alone represents or even corresponds to a fail or a success of someone['s intelligence]. 1. Team looks strong, has an experience in Forex platform operations. 2. Strong advisors. Not a lot of them though. 3. A good community outreach. It is sporadic, but it actually looks very price effective at this stage. 0. "What is YouToken? YouToken - First Blockchain-based Crowdfunding platform." This is BS, that's simply a lie. Just Google it. You can't do it with YouToken. That is a misleading slogan. You can sell a _project_ of your's, not sell your personal shares or shares of some trust, which holds all your possessions including all future assets (which wouldn't be a legal and/or a tax efficient way to raise a capital in the most countries). Therefore, YouToken lets you sell a stake in your project even at its very early stage. Going fast forward to the conclusions, it simply makes YouToken an early stage VC platform with 4 different types of contract (including 1 non-profit). That being said, YouToken is not by any mean a scam, even though its general marketing approach is based on a lot of BS and is misleading at best. YouToken is indeed a legit idea. It is deceitfully marketed, and it will likely lead to a devaluation soon after the ICO and an extra backlash after the YTN token will go on with a public trading. 2. Legal side of the project doesn't look consistent. There are some parts clearly written by a lawyer, but some crucial parts are not disclosed nearly to a satisfactory manner (the consequences of the YTN_creatorname token US and/or local regulations and the following tax consequences for the both sides, revenue reporting standards, arbitrage etc.). 3. Tokenomics is not supported with any calculation. YTN token value appears to have a serious soon after the ICO plummet potential. Especially since it is unclear, how many tokens were sold during the pre-sale at $0.01 (!ATTENTION! ICO Investors, someone got the same at the 90%/93.3% discount, so they may have a financial incentive to sell way lower, than you). That crazy 90% discount at the pre-sale alone is indeed a huge concern for the tokenomics. That would be true, if someone would guarantee that exchange rate (e.g. the Asset Manager with the according license), or if you'd include a withdrawal/liquidation option in the contract. Yet the YTN price purely depends on the internal (and potentially external) market(s), therefore that price calculation model may not be relevant and deceits a potential investor into belief, that YTN token has indeed that intrinsic value. We would be happy to discover, that it indeed has it. 4. No contract address is officially declared neither at the YouToken website nor in its white paper as of 04.04.2018. We found the the ETH address, which is likely used by YouToken (0x7e921CA9b78d9A6cCC39891BA545836365525C06), but there is not official confirmation. Interestingly enough, the ETH address, that we were provided with to conduct our investment had no contract attached nor it had any transaction records at 10.00 CET 04.04.2018. 5. Team profiles are insufficient, some information is missing. Team itself is not complete or some members were hidden. All executives have a full-time job with a long-existing corporation and will unlikely fully switch to YouToken project management. Therefore it is unclear, who will actually manage this project on daily basis and if that person's skills and experience are sufficient to this role. 6. Both Singapore and US structured ICOs seemed to be in a clear disadvantage in 2018. Extra costs, bad regulations. That will eventually affect the token value. 7. Some crucial areas have no dedicated person neither in the team, not among the advisors (Blockchain, ICO, Financial and Token Legal etc). Long story short: we wouldn't recommend investing into YouToken ICO after the April 1st. The token's value has too many reason to drop soon and a few reasons to grow in the long term, so it would be the better time to buy it later at a lower price. Obviously, each of our concerns and advise may be addressed and/or answered by the founders and the developers of YouToken and it may lead to improves in the YouToken ICO, consequent improves in rates and improves of the overall investment recommendation. Initial development of YouToken’s core concept.